This walk is a great one way walk to do after spending some time at Putty Beach. The walk uses Hawke Head Drive to head along the ridge to Box Head. 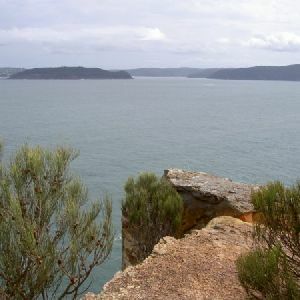 The headland has superb views over Broken Bay to Barrenjoey Headland and out to sea. Lobster Beach is another great beach in the area with views over to Woy Woy. A great walk from beach to beach. 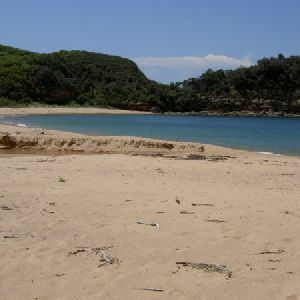 Putty Beach, Bouddi National Park, is a large south-easterly facing beach that is almost completely framed by National Park. 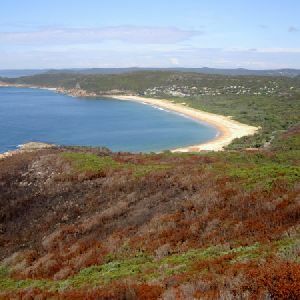 On the north-eastern end of the beach is the Bouddi Trail, and a large car park and campsite. At the south-western end of the beach is the Killcare Surf Lifesaving Club. 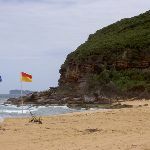 Putty Beach is a patrolled beach and and locals enjoy it for a surf, swim or dive. From the beach, this walk heads up the hill along a stony path, to the car park behind the beach. Continue straight: From the car park, this walk walks onto Beach Drive and turns right to head up and away from the beach, to the intersection with The Scenic Road. A short distance up the hill, this walk soon takes the first left onto Nukara Ave. The walk continues up Nukara Ave to the second road on the left, Hawke Head Drive. Continue straight: From the start of Hawke Head Drive, this walk heads up the hill following the road and power lines. The walk winds up Hawke Head Drive, where the road becomes unsealed and has numerous speed bumps. The walk continues along the road to the intersection with a management trail, and gate on the right. Continue straight: From the intersection, the walk follows the management trail up the hill, leaving the gated management trail behind on the right. The trail undulates along the ridge line for some time, with views to the right of the track over the Rip Bridge and Woy Woy. The trail then starts to head downhill, arriving at a car park, to the right, signposted ‘Tallow Beach 900m’. Continue straight: From the car park, the walk follows the management trail past the ‘Tallow Beach 900m’ signpost. The walk soon passes around a gate and continues down the hill. The walk passes an unfenced cliff warning sign and (ignores) a track signpost (‘Tallow Beach’) before heading up the hill to the intersection, signposted ‘Tallow’ and ‘Killcare’. Turn left: From the intersection, this walk follows the ‘Tallow’ arrow along the management trail, going down the hill. The trail tends right for approximately 30m, to the signposted intersection for ‘Box Head’ and ‘Tallow Beach’. Veer right: From the intersection, the walk follows the ‘Box Head’ sign along the track. The walk follows the track for a short time, then crosses a rocky area before passing through a small clearing. 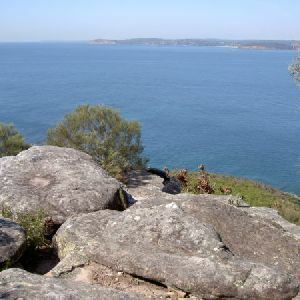 The track narrows and meanders for some time, crossing numerous rock surfaces and rocky outcrops, then follows the top of the cliff line of Box Head out to a point that overlooks Barrenjoey, Lion Island, Broken Bay and out across the ocean. Turn around: From Box Head, the walk follows the track away from the sea and the opposite headland, generally following the cliff line up the ridge. The track drops into a saddle, then climbs up the ridge for some time, crossing many rocky outcrops. The track then widens as it enters a small clearing and continues for a short time to the signposted intersection. Veer left: From the intersection, this walk follows the management trail up the hill away (following neither the ‘Box Head’ nor ‘Tallow Beach’ arrows). The walk continues away from these signposted trails, going down into a saddle and up the hill on the other side to the sign-marked intersection. (5.42km) Hawke Head Drive → Water tank Int. Veer left: From the intersection, this walk heads up the hill, following the sign towards ‘Lobster Beach’ and ‘Wagstaff’. The track climbs the knoll heading right, then swings left rounding the back of the knoll for approximately 100m to the signposted intersection. Veer left: From the intersection, this walk follows the ‘Lobster Bch. – Wagstaff’ sign along the ridgeline. The track then winds to the left of a knoll, towards the sea, and leads along the fenceline. The track undulates down the hill to a sign ‘Pretty Beach, Wagstaff’. The track turns left here, following the sign down the rocky surface for a short time, before coming to the intersection above some houses and two large green water tanks, on the right. (6.37km) Water tank Int. → House Int. Continue straight: From the intersection, this walk heads steeply down the hill to the left, with the water tanks below to the right. The track passes a set of gates on the left, to continue away from the houses. The track heads past a house with a steep roof (on the left) to continue over a driveway. The walk then leads along the back fence of a house, to the corner at the sign marked intersection. Turn left : From the intersection, this walk heads up the stairs following the sign to ‘Lobster Beach’. The walk follows the many stairs up the hill, to the ridge line with a house on the left. Continue straight: From the ridge, this walk heads down the hill towards the beach. The track heads steeply down to a lookout platform above the beach. The track then continues along the hillside to a set of boardwalked stairs which tend right, down to Lobster Beach. Lobster Beach, Bouddi National Park, is a 300m long, west-facing beach on Broken Bay. The beach, backed by a steep hill and edged by rocky shores, provides westerly views over Broken Bay to Pearl and Ocean beaches. The beach has toilet and garbage facilities just above the sand. (7km) Lobster Beach → Wagstaff Ave Int. 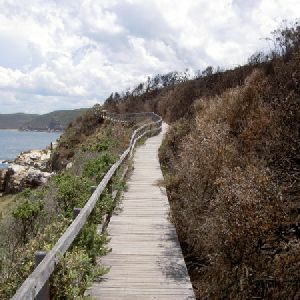 Turn around: From Lobster Beach, this walk heads away from Broken Bay up the boardwalked stairs. The track tends left up the hillside, to a lookout platform. The walk then heads up the steep stairs to the top of the ridgeline – near the top of the ridge is a bench. The track then continues up the intersection on the ridge, opposite a house. 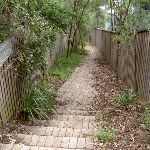 Continue straight: From the ridgeline, this walk heads down, away from the beach by the steep staircase to the signposted intersection at the corner of two fence lines. Continue straight: From the intersection, this walk follows the ‘Pretty Bch, Wagstaff’ sign down the hill between the fencelines. The track continues between the houses to the road below. Around 6km of this walk has gentle hills with occasional steps, whilst the remaining 1.7km has short steep hills. 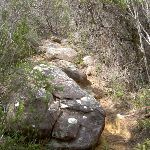 6km of this walk follows a formed track, with some branches and other obstacles and another 1.1km follows a clear and well formed track or trail. The remaining (770m) follows a smooth and hardened path. Around 7km of this walk has directional signs at most intersection, whilst the remaining 970m is clearly signposted. This whole walk, 7km requires no previous bushwalking experience. 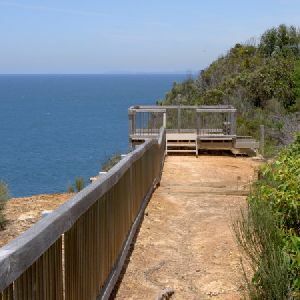 Around 6km of this walk has limited facilities (such as not all cliffs fenced), whilst the remaining 1.9km is close to useful facilities (such as fenced cliffs and seats). A list of walks that share part of the track with the Putty Beach, Box Head, Lobster Beach to Pretty Beach walk. 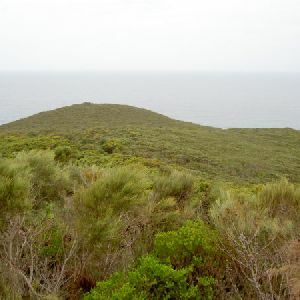 Starting on Hawke Head Drive, this walk explores the southernmost ridge in Bouddi NP. 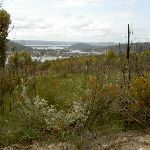 The walk provides excellent views over Woy Woy, Broken Bay, Hawkesbury River and the Tasman Sea. It takes in spectacular views over Lion Island and Pearl Beach from the many rocky outcrops along the Box Head ridge. This walk, from Hawke Head Drive, is the most direct route to Box Head. The walk explores Box Head headland and the many rocky outcrops on the way. 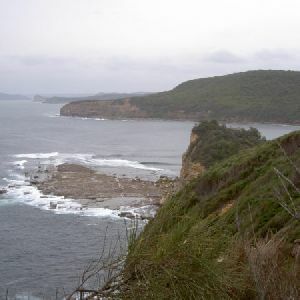 There is great variation in the vegetation and a great variety in the views across the ocean and up into the mouth of Broken Bay. The cul-de-sac at the end of Hawke Head Drive has limited parking. 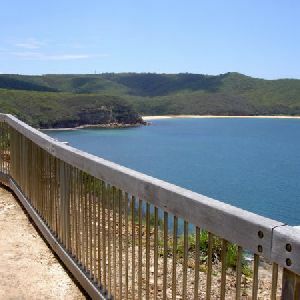 This walk is an excellent way to see some of Bouddi National Parks greatest views. 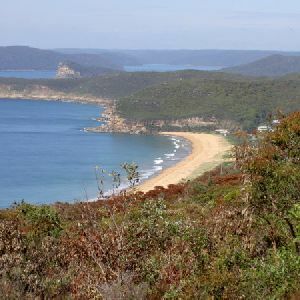 The walk follows the Maitland Bay Track and the Bouddi Coastal walk to Putty Beach. The track shows off Maitland Bay from a number of different lookouts, while passing through different types of vegetation. There are also many interesting rock patterns along the coastal cliffs. This walk explores some of Bouddi National Park’s hidden beaches and the Box Head lookout. The views over the South Pacific Ocean and Broken Bay are magnificent, while the secluded beaches of Tallow and Little Tallow are great spots for lunch and to dip the toes in. The vegetation is mostly heath along the service tracks, and larger eucalyptus trees along the bush tracks. This overnight walk takes in the majority of the magnificent Bouddi National Park. The walk starts from the pleasant Putty Beach camping area, with its very friendly Brush Turkeys. The walk heads along the ridge towards Little Beach, then along the beaches. 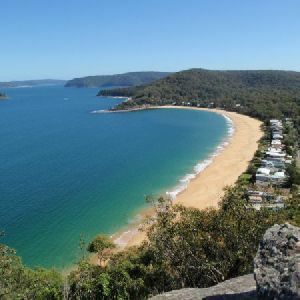 This circuit walk visits many beaches and views from lookouts before returning to Putty Beach campsite. The second day explores the Box Head and Lobster Beach areas, with a shorter day allowing time to drive and drop in to Hardy’s Bay. A list of walks that start near the Putty Beach, Box Head, Lobster Beach to Pretty Beach walk. The Bullimah Lookout Track follows the spur down the hill from Marie Byles Lookout and car park. The track zigzags a little on the way, passing around boulders. There are excellent views from Bullimah Lookout over Maitland Bay. 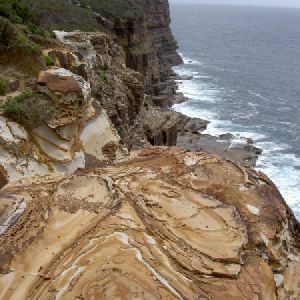 A fantastic loop walk, showcasing the stunning coastal views and scenery of the Bouddi National Park. Optional sidetrips to a couple of beaches, and the opportunity to see the wreckage of the S.S. Maitland, add some variety to the walk. 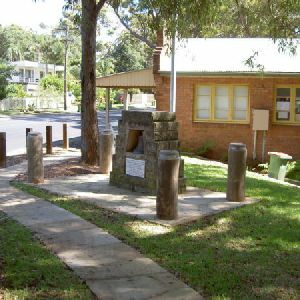 This walk forms a loop, starting at the Maitland Bay Information Centre. 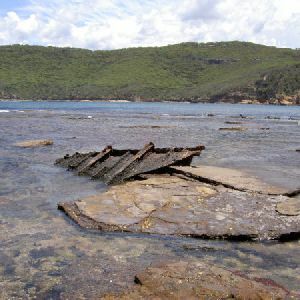 The walk visits Maitland Bay, with an optional side trip to the S.S. Maitland Shipwreck, best seen at low tide. The changes in vegetation with altitude are evident and provide a lot to see along the track. 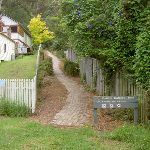 Starting from the Maitland Bay Information Centre, this walk heads down and around the hill to follow the spur out to Bullimah Lookout. The track winds through the bush giving glimpses of Maitland Bay from several rocky landings. The views along the way, and from the lookout are fantastic. From Maitland Bay Information Centre, this walk heads straight down the hill to Maitland Beach. On the way down, the track passes many rock landings which act as lookouts over Maitland Bay and the lush bush of the surrounding gullies. Maitland Bay Beach itself is a wonderful sandy beach which is popular for swimming (although there are no beach patrols). From the Maitland Bay Information Centre, this walk heads straight down the hill to Maitland Beach and the shipwreck of the S.S. Maitland. On the way down, the track passes many rock landings providing great views of Maitland Bay and the bush of the surrounding gullies. Perched on the edge of the rock shelf, in the water east of the beach, are the remains of the S.S Maitland. The walk down to the shipwreck is magnificent and it is well worth spending some extra time to enjoy the beach. This lovely short walk takes you from the large water tank, along an old trail and track to two fantastic fenced lookout platforms. There are a few unfenced views along this shaded walk. A picnic table among the Sydney Red Gums, just before the two main lookouts, makes a wonderful spot for a snack. 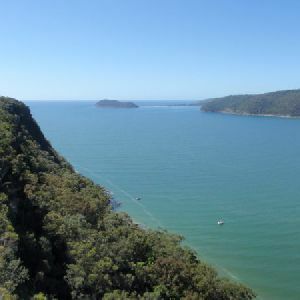 The lookouts provide great views over Umina Beach, Brisbane Water, Bouddi National Park, Pearl Beach and out to the ocean. A great spot on a sunny day or for a sunset. 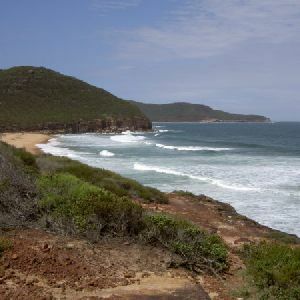 This walk explores a large part of the Bouddi National Park coastline. Features of this walk include the walk out to Bombi Moors and down to Little Beach. The tracks connecting these spots explore some excellent rainforest areas and wonderful heath covered headlands. Interesting, beautiful and a great place for a swim, this walk is well worth the effort. This is a great way to walk off a lunch if picnicking at Dingeldei Picnic Area. The Bouddi Lookout walk meanders through the bush, without any views of the ocean, until it reaches the rocky platform of Bouddi Lookout. After enjoying the view, you can head back up the hill to Dingeldei Picnic Area in time for another snack break. This walk is great following lunch at Dingeldei Picnic area. 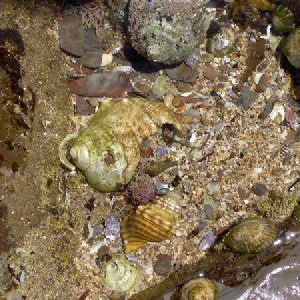 The walk explores the rock flats of Maitland Bay, with many interesting shells and the shipwreck of the S.S. Maitland. The walk provides the option to spend time at Maitland Beach on the way to the wreck. The wreck is best seen at low tide, along with the rest of the rock flats below the headland. 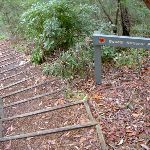 This walk follows a wide trail then a track to the fantastic views from Warrah Lookout. 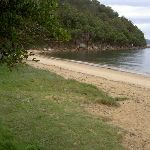 From Pearl Beach, this walk follows the roads to the lower end of Pearl Beach / Patonga fire trail. Continuing up this trail, the walk passes some sandstone caves and further on, enjoys the fenced Warrah Lookout. There are some great views before returning the same way back to Pearl Beach. This is a great circuit walk, leading walkers from the hills, down to the beach. The circuit takes in the vast changes in vegetation as it descends to Little Beach, then follows the coast, heading up to Dingeldei Picnic Area. The sandy service trails and views out to sea make this a magnificent walk. 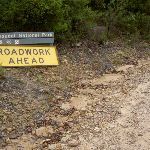 http://new.wildwalks.com/wildwalks_custom/includes/walk_fire_danger.php?walkid=nsw-bouddinp-pbbhlbtpb Each park may have its own fire ban, this rating is only valid for today and is based on information from the RFS Please check the RFS Website for more information.